You can make your community forums more integrated with your company website by removing "forumbee" from the URL and using your own company domain name. For example, forum.mycompany.com instead of mycompany.forumbee.com . Where your domain name is registered, you need to create a subdomain and configure it so that when a user browses to that subdomain address, they are redirected to your Forumbee community. A subdomain might be something like community.mycompany.com or forum.mycompany.com , where community and forum are the subdomains. In Forumbee this feature is called domain aliasing. Note: this feature requires an active subscription and is not available on trial accounts. If not already done, register a domain name and add a subdomain to it. If you need assistance with this contact your company system administrator or your domain name registrar. Configure your DNS to point your subdomain to your Forumbee community. Consult your system administrator (if you have one) before preceding. In your DNS locate the CNAME entry for the subdomain you are using (for example: forum), or create the CNAME entry if it does not exist. Point that CNAME entry to your forumbee community URL, such as mycompany.forumbee.com . In Admin, navigate to Settings. Click to expand the Advanced panel. 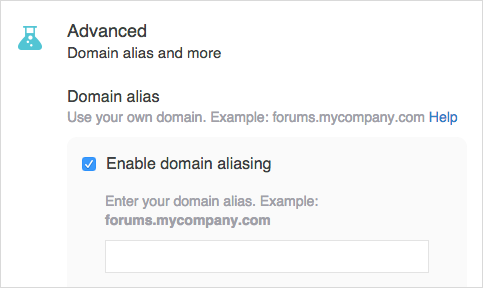 Check "Enable domain aliasing" and enter the three-part subdomain address you will be using, such as forum.mycompany.com . After your domain is configured and verified, we will provision an SSL certificate for your account. It may take up to 24 hours to become active. Super Christian In this case we recommend using a subdomain such as "www". You can then set up a server side redirect from your root domain to www.mydomain.com. If you need additional technical details, please contact support@forumbee.com and provide your forum and domain information. Thanks! "Your DNS Status: not configured"
Forumbee Support Is there a downside to using the A record instead of the CNAME record? It appears that redirection from our "vanity" URL works properly. Neil A redirect means that your custom URL will not display in the users browser when they view your community. For this reason, you need a CNAME pointing to forumbee.com .